Now this is how you respond to a challenge. 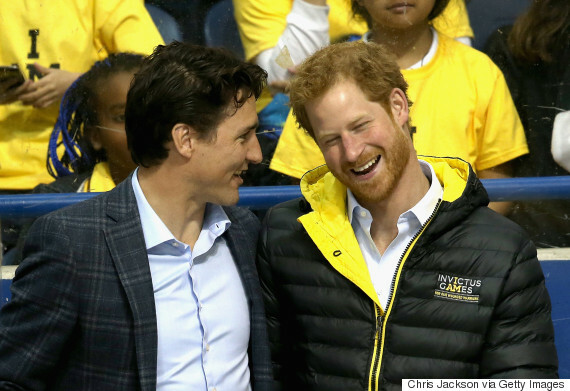 Last week, President Barack Obama and Michelle Obama challenged Prince Harry to bring his A-game to the 2016 Invictus Games. The 31-year-old prince had his own response (with his grandmother), but after spending a good chunk of Monday with Prime Minster Justin Trudeau in Toronto, it seems like even our PM is ready for the challenge. Trudeau not only had a message for both the U.S. and the U.K. but he also showed us (and the rest of the world) exactly how Canada brings it — with push-ups, of course. "Oh hey, I just thought I'd show our friends in the U.S. and the U.K. how Canada brings it," he says in the video above. "Your Majesty, Prince Harry, President and Mrs. Obama, BOOM." The 2016 Invictus Games, a sporting event for wounded military personnel, will take place in Orlando this year. The prince, who was in Toronto on Monday also officially started the countdown to the 2017 Games in the city. Meeting with Trudeau, the two attended a sledge hockey game at Ryerson University's Mattamy Athletic Centre and took photos with kids in the crowd. We're just hoping the prince responds with his own round of push-ups.